The following excerpt is from Chapter 8, The Karate Consciousness – From Worldly Warrior to Mystic Master by Kiado-Ryu Grandmaster Richard Andrew King, available at www.RichardKing.net/books and from Amazon. The “D and C” are the initials for Discipline and Control respectively. They generate the “Discipline-Control Factor” – an idea basic to all principles of achievement, without which there could be no accomplishment. The relationship between Discipline and Control is that the former generates the latter. Control is regulation. Discipline is the training and exercise needed to effect the regulation. In karate, for instance, the placement, power and effect of any striking blow, be it a kick, punch, chop, rake, thrust, etc., is variable. Proficiency, however, and the extent of the variations is a matter of control. Yet, as any practitioner will confirm, the achievement of control takes work, concentrated effort, practice and repetition. Discipline is the force which binds all of these components together and creates the efficiency. If there is any trait or characteristic of mastery in anything, it is control. The successful painter, musician, ballerina, writer, architect, athlete, business executive, public speaker, educator, pilot, etc., all express control in their work because without it there would be chaos and disorder. Success is the result of the ability to control. To be clear: control is the mark of a master. In achieving self-mastery, therefore, we must learn to control ourselves, our actions, our thoughts. But in this lesson of learning control, we must also subject ourselves to discipline. This facet of living is generally the most disliked. It’s fun to be in control, to so move the strings of the lyre that only beautiful, mellifluous melodies are created, but it’s not so fun to subject our hearts, minds, souls and bodies to the discipline, the long tedious hours of practice, the sweat, the pain, and the agony required to produce beautiful music and artistry. Mastery – all of its manifestations, joys and exhilarations – has its price. But in order to cross the bridge to this realm of ascendancy we must pay the toll. It is not so great an expense, although many consider it an exorbitant fee. But regardless of the price, the fields of perfection are the most exquisite gardens of beauty, and many enlightened souls are expending their last pieces of silver to cross to the other side. Basically, there are two ways to impose discipline: intrinsically (self- imposed) and extrinsically (non-self-imposed). The former is the higher ideal and should be strived for and maintained by the student. The latter may be considered as the ladder to the former. Non-self-imposed discipline is when others provide the regulation we need in order to progress. Regardless of how it is achieved, a high degree of discipline is essential to a well-functioning life system, for it is always the discipline that insures control, and it is control that effectuates transition to increased levels of expression of the life force. The advanced karateka knows full well the importance of the D.C. Factor. It is the only way to attainment in the art. In the incipient stages of his training, he receives non-self-imposed discipline from his instructor in the teaching session. During individual practice he utilizes self-discipline. As he progresses along the vertical growth spectrum, the amount of discipline should shift gradually from the extrinsic to the intrinsic form, for the goal is to reach a state of total, individual integration, part of which is self- discipline. The new student should welcome this concept of discipline, for as he learns it he can transfer its principles to other areas, employ them in his daily experiences and increase the quality of his life. When we speak of discipline in either form we are not referring to harsh criticism or censure but guidance and positive regulation. We all need discipline, and as we utilize it to refine and polish ourselves and our abilities, we must be careful to do it in a loving manner with care and concern. If self-imposed, love may be assured. However, if we are the recipients of extrinsic discipline, we can only hope that love is the dispensing agent. In the latter case, even if there is little love rendered, wisdom dictates that we acknowledge what is meant for our well-being and forgive the disciplinarian for any absence of the great vibration. However, it must not be overlooked that discipline can be a form of love and this needs to be considered when evaluating any disciplinary measures. End of Chapter Excerpt. 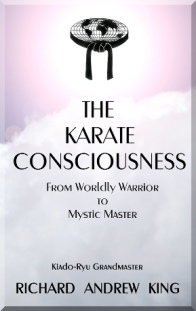 Read the entire Chapter in The Karate Consciousness – From Worldly Warrior to Mystic Master by Kiado-Ryu Grandmaster Richard Andrew King, available at www.RichardKing.net/books and from Amazon.